Was out riding on Sunday. Got quite a few miles on no issues. Stopped at this lookout and went for a quick hike. Came back and the bike was slow to turn over but it started. Went to get going and it died and wouldn't start again. Pop started it down the hill and it went but wanted to die as soon as I let off the throttle. Kept it throttled up at lights and such and was able to keep it running. About 3/4's of the way home in the country going about 50 it just dies. Absolutely no power engine is dead, won't pop start when I try. Let it sit 15 min and I get it to fire up. It really didn't want to run but manipulated the throttle and got the rpm's up and took off. Got 5 min down the road and dies again slowing down for a corner. Same thing wait, fire it up, get rpms up and go like heck. Make it 5 min and it cuts out again going 55 mph. This time call the old lady to come get me with some tools as im less than 15 min from home. So I pull the battery and charge it up for an hour, go back down put it in the bike and it starts right up no issues and I make it all the way home on that charge. Left the battery on the charger overnight and haven't done anything with it yet. It is a gel performance battery not lead acid so I don'[t think the battery has an issue. So what do you think, Regulator Rectifier or Stator or both? It definitely does not sound like the battery's getting enough charging voltage to stay fully charged, but even if you don't suspect the battery at all, it would still be good to have it load tested, to verify it's capable of holding a charge... it's free at a lot of auto parts stores anyway (definitely at O'Reilly's), so there's nothing to lose. If the battery IS capable of holding a charge, then there's really no need to perform the bottom test, to check charging voltage, but you sure could. 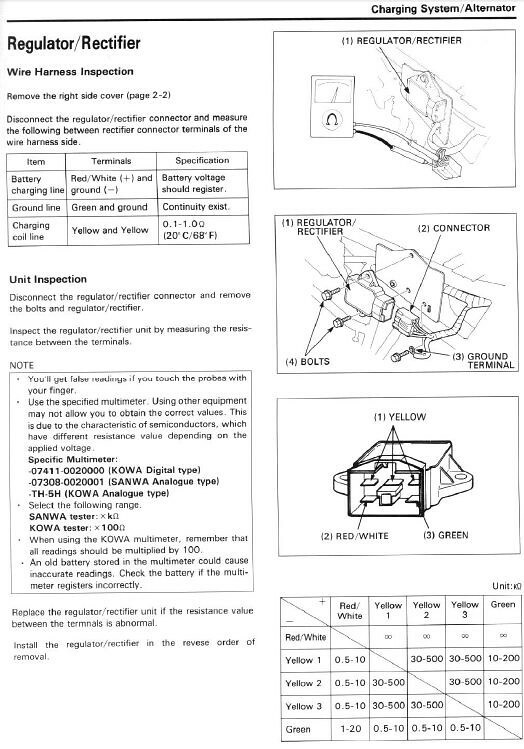 The thing is, if the battery is good, and no circuits are drawing amperage when they shouldn't be (short circuit somewhere) then you could skip this one, because you already know there's a charging issue, you just need to find out if it's the stator or R/R, which is where the next tests come in. 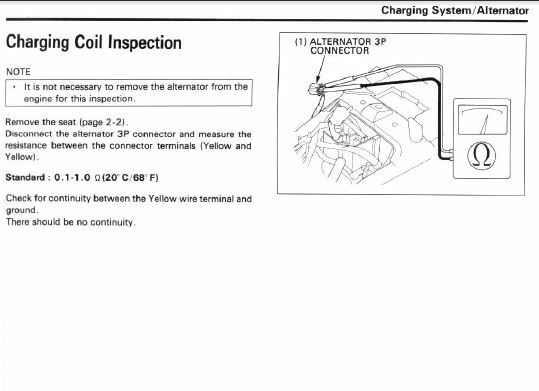 And lastly, this is the test for the stator unit - if the R/R checks out fine, then there might be an issue with the stator and/or harness. Again, even with a relatively new or brand new battery, don't rule it out, as cells can be damaged from trying to use it with low voltage, and depending on if and how the R/R has failed, what could be the case, is that the R/R has damaged the battery due to over-voltage, and the battery simply can't hold a charge anymore. Thanks for posting this troubleshooting info. I'm gonna do this after my carb rebuild is finished. Question: Even if the the R/R is toast, shouldn't the bike still run? I thought the stator would still supply enough voltage to the ignition coils to keep the bike running. No problem! And I'm curious as to how Jeff's situation has come out... Jeff? Nope, the R/R is responsible for regulating the voltage from the stator, and then sending it on - without the R/R, there is no charging system to speak of - plus, if the R/R has failed where it sends too much voltage, then the battery eventually gets cooked. Wow late to reply to this one. Changed the RR and it was good for another month or so. The stator tested fine so I just did the RR. Well one day I was headed to work. Stopped for gas and she was hard to start so I said nope I'm just going to run it home and take the truck. Made it home no problem but once I turned it off it was dead. So pretty sure the battery was fried from the bad RR. Anyway I had become very busy last summer with a few projects and the weather was terrible so I just let the old girl sit. Ordered a new battery and stator the other day. If the old stator tests fine I may leave it in and see how it does and just have the other as a just in case but then I'm thinking these things tend to fail in sequence so perhaps I should just do it and be done. Either way she'll be all set to ride on the first decent day of the year. Hopefully I put more than 1000 miles on this year. Check the wiring harness under the left rear panel - there's a 7 wire connector there to the battery from the reg/rec. I'm willing to bet it's melted. Replace the wiring and fit an Electrex Reg/Rec. I have a similar issue on my 92 F2, where it dies after pulling the clutch in at when slowing from higher speeds.. Around 45 mph no issue, but around 55 and then pull in the clutch, it dies... Not sure if it's a fuel or Electric Problem... Just changed my R/R last week, no change.... I'll check the wiring on the left side to see if mine looks melted.. but further info if you resolved this would be greatly appreciated as I commute on my bike daily..
You'll want to fix the melted wires that connect to the R/R if they are but you can still get away with it. I recommend installing a cooling fan and then you won't have to replace this thing anymore. I live in AZ and had to replace it every summer. Now I don't have the issue anymore. Below is a link to the install. If it blows after this, you might have a bad stator but I'd do this mod before getting to that thing. Also the stator replacements on the market now for this bike all seem to come with the wrong length of wire as I've bought both after market replacements available. 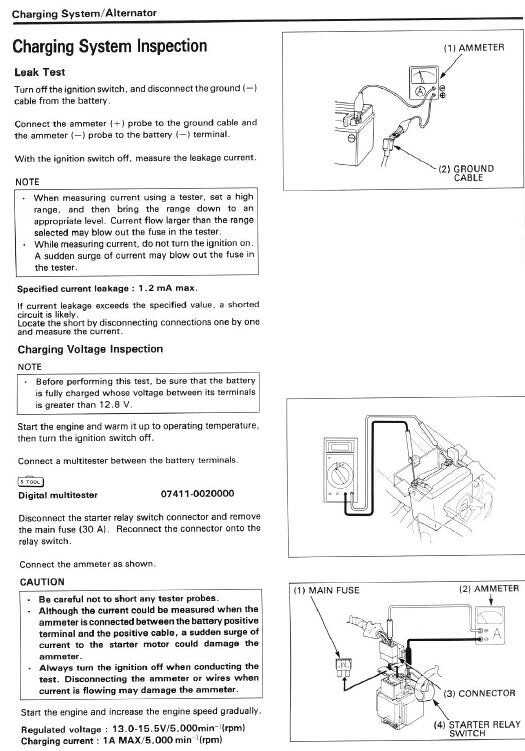 Most common issue with the RR is with it putting out 16+ volts to the battery which cooks it. Rev the bike up to 5 grand and make sure the system is still sitting at 13-14 volts. If it gets up to 15+ (usually around 16) then it's def a bad RR and will eat batteries for breakfast. As for the bike dying when popping the clutch at 55 MPH, nothing to do with the RR or charging system. If it is then it's RPM related not speed. That sounds more mechanical to me. I'd start with a carb clean and sync. DO NOT proceed anywhere else unless you are absolutely sure this is done correctly. If so then start pokin elsewhere. Quick Reply: Pretty sure this is bad R/R what do you think?